where the braces indicate surface concentrations in mol/g of solid. If the concentrations of the two types of sites resulting in equations 1 and 2 are the same, there will be no net charge on the surface. This condition is called the point of zero proton charge, pzpc (or zero proton condition, zpc). At solution pH values lower than that required for attaining the pzpc, the sites become protonated and an excess positive charge develops on the surface; here, the oxide behaves as a Bronsted acid and as an anion exchanger. The contrary occurs at pH values higher than the pzpc, where the oxide behaves as a Bronsted base and cation exchanger. Mixed oxides can have both exchange types, depending on the relative pK values of the different surface sites. FIGURE 1. Determination of the point of zero charge, pzc of a simple metal oxide by a Potentiometrie mass titration technique, PMT. (Note: In this figure we assumed that pzc > 7, but the arguments apply to any other case as well, see Balderas, 2006 and Vakros, 2002). 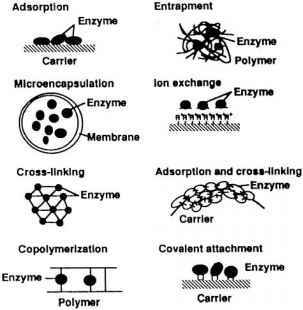 Reprinted from the Chemical Educator, vol. 11, No. 4, 2006, pp. 267-270, with permission. which the sum of the all the surface positive charges balances the sum of all the surface negative charges is called the point of zero charge, pzc. In the absence of sorbed ions other than protons, the pzpc is equal to the pzc. (Note that the IUPAC recommends using periods after each letter in these abbreviations, but for the sake of simplicity we have omitted them). A simple and fast method that gives a reasonable approximation to the pzc consists in locating the intersection of one or more titration curves performed with constant ionic strength and different amounts of solid, and that of a blank solution (i.e., without the solid). This is called the potentiometric mass titration method, PMT. This method is better understood by analyzing the plot in Figure 1 with the aid of the explanation given below. The points a, b, and c in Figure 1 correspond to the blank solution, and d, e, /, and g correspond to the sample. The blank solution consists of w mL of a solution of an inert, supporting electrolyte (e.g., KNO3) of concentration x; thus, the point at a corresponds to the natural pH of this solution. Upon addition of y mL of NaOH of concentration z, the pH of the blank increases to b. By doing a potentiometric titration with a strong acid (e.g., HNO3), the blank curve is generated (c is an arbitrary final point). The initial pH of the sample solution (composed of w mL of the inert electrolyte solution plus m grams of the solid hydrated oxide, MOH) is at d (i.e., below the pzc due to the removal of H+ from the solution by the neutral surface sites in MOH to form MOHj (eq. 1). Then, addition of the same y mL of z M NaOH to this suspension of the sample brings it to the point e, which is below b. This is because the OH- added play three roles: they serve to neutralize the H(+q) and the MOHj(surf) created during the a -»■ d step, and to remove H^urf) from the resulting MOH sites so as to create basic sites (MO-) at the oxide surface. By doing a potentiometric titration, the Hjq) added from e to /(see Region I of the sample curve) play two roles: some of them neutralize the OH(~q), and the others neutralize the MO(~urf). 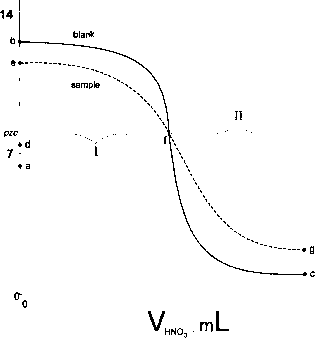 This is the reason for the smaller pH values in this curve as compared to those in the blank curve. a minor role, i.e., to neutralize the (small amount of) OH(~q) remaining in solution and a major role, i.e., to protonate the neutral MOH(Surf) sites. The difference in pH between the sample and blank curves in this region will therefore be essentially proportional to the amount of solid sample in the suspension. Between the end of Region I and the beginning of Region II in the sample curve, there is a small region (or even a single point,/) where all the Hjq) added serve to neutralize the OH("q), just as they do in the blank curve. For this reason both curves intersect at this point, which is then identified as the pzc. This intersection should appear at the same pH value for any amount of oxide placed in the solution. Literature results also show that a single determination curve intersecting the blank curve gives a very good approximation to the true value (see Vakros, 2002). (We hereby call this the simplified potentiometric mass titration method, sPMT). In addition, the pzc determined using this method is independent of the charging mechanism assumed for the oxide surface, of the structure of the double layer, and of the surface-site density.